Following last year's words 'n' music creepfest Weird Tales For Winter Jonny Mugwump of Exotic Pylon infamy presents a brand new season of unsettling stories for 2011. 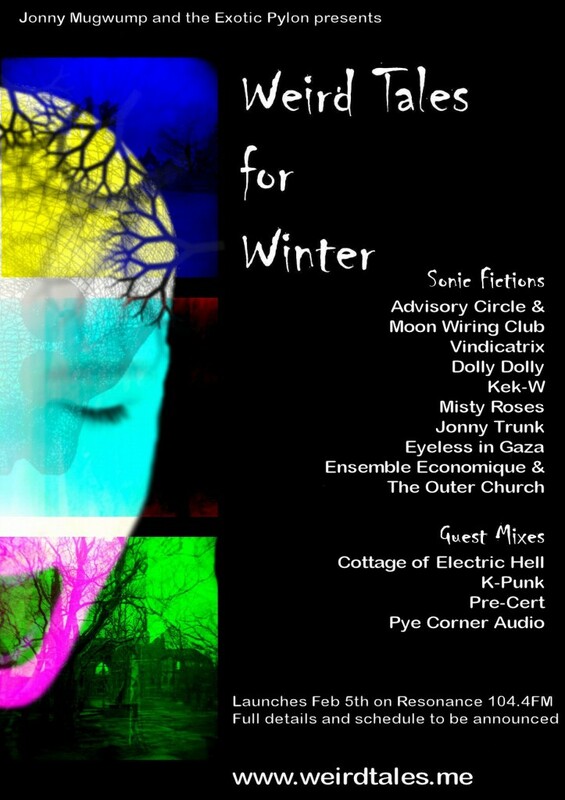 As you can see, there are some rather exciting names attached to this project, which includes an exclusive collaboration between The Outer Church and Ensemble Economique alongside Vindicatrix, Jonny Trunk, The Advisory Circle and more. Feeling the chill...? You will. 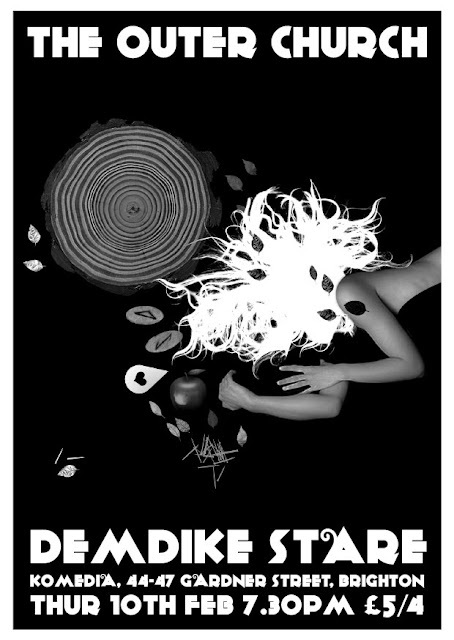 For its February 2011 edition, The Outer Church is proud to present a live performance from Manchester's occult cratediggers Demdike Stare. Miles Whittaker (MLZ/Pendle Coven) and Sean Canty (Finders Keepers) alchemise elements of techno, dub, drone, early electronics, astral jazz and non-western musics into a haunting and elusive whole, shaded by the pair's profound appreciation of vintage horror cinema. In keeping with the air of supernatural intrigue surrounding the project, its name derives from the pseudonym of Elizabeth Southern, one of the individuals accused during the witch trials which took place at Pendle Hill, Lancashire in 1612. Following their 2009 debut, Symbiosis, Demdike Stare's acclaimed 2010 trilogy of vinyl-only albums - Forest Of Evil, Liberation Through Hearing and Voices Of Dust - has recently been compiled by Modern Love Records into a covetable 3CD set with an extra 40 minutes of bonus material. Supported by their own visuals, the duo are a formidable live proposition. As they told FACT magazine last year: “We like to incorporate all of our identity with the live set, so we have visuals that are chosen for each section of the show, and we use records to mix live over our own music to add another layer. We like to improvise as much as possible – this can also be dictated by the atmosphere of the venue and crowd too, which all becomes part of the show." 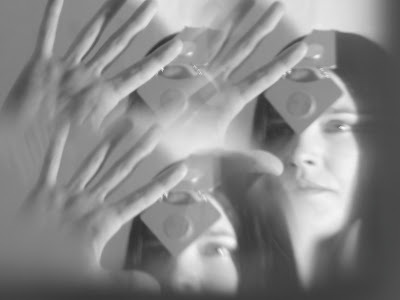 This edition of The Outer Church is dedicated to the memory of Trish Keenan, as are all future editions. I was fortunate enough to meet Trish Keenan in person on two occasions. In 2008, I heard Broadcast were working on the follow up to 2005’s Tender Buttons. I’d wanted to interview them for ages, so I quickly fired off a pitch to The Wire, who responded with enthusiasm. I initiated contact with the group through their MySpace and exchanged a few emails with James, who advised me - very politely - that I had been somewhat premature. Months went by, no album materialised and the pitch looked destined for the bin marked ‘never mind’ until Warp Records announced the release of Broadcast & The Focus Group Investigate Witch Cults Of The Radio Age in late 2009. The Wire dusted off my dormant pitch and I was commissioned to interview Trish Keenan and James Cargill for the cover feature of issue 308. For some time, I was under the impression that Broadcast still lived in their hometown of Birmingham. It wasn’t until the eve of the interview that the PR told me they had moved to Berkshire. I was intrigued. When the PR added that the place was, in her words, “somewhere beginning with ‘H’” I started to feel a little strange. When it was confirmed that they had indeed relocated from Birmingham, not to London or Berlin, but to a place where I was fairly sure no professional musicians lived and where I had spent a great deal of my childhood, I was speechless. My grandma lived there! In fact, she had lived there for longer than I had been alive. After that revelation, the coincidences began to pile up. Names were duplicated, dates took on multiple significances, realities which seemed completely unconnected began to merge and overlap. It was at once eerie, amusing and appropriate, given that a big part of Broadcast’s appeal for me was their otherness. Their music - especially on Tender Buttons - always conjured visions of an electronic seance. Sitting opposite Trish and James in the lounge of the Three Swans Hotel, I was struck by how forthcoming they were, how much they were willing to share. Not only about their music, but also about their lives, from mundane minutiae to candid reminiscence. James related how he had scarred his forehead falling off his bike along the canal while Trish told me about her family back in Birmingham. This wasn’t small talk, it was raw and honest in a way I don’t usually expect from people I hardly know. But I was genuinely interested, and I think she and James picked up on this. Not that the conversation was without its moments of levity. If Trish was an intense conversationalist, she was incredibly funny with it. This was unmistakably the same woman I had heard making what sounded like a lewd aside about playing the recorder at a festival in Birmingham three years earlier. Following the interview, I was asked to join them at a local cafe, where they bought me scampi and chips. It's impossible to forget kindness. Especially when it involves food. I remained in contact with Trish and James via email. Trish's emails were always a delight, whether she was updating me on local affairs in Hungerford or telling me about some odd specimen of wildlife she had encountered. It was conversation with Trish that inspired me to start a monthly event. A phrase she used repeatedly - "magic hour" - rang, bell-like, in my head. Though I didn’t use the term as the name of my event, it accurately described the feel I was aiming for. In addition, I had been deeply impressed by the imagery the pair had put together for the short films accompanying the release of Witch Cults. I interpreted their use of macabre Berkshire landmark Combe Gibbet - gleefully pointed out by Trish in one of her emails - as confirmation that I should go ahead and put all the aforementioned synchronicities to good use, harness the energy that they had generated. Needless to say, I’ll always be grateful for Trish’s encouragement. The second - and sadly, final - time I saw Trish was at the Unconscious England event in Bracknell last year, for which I had been asked to DJ. I sent an invitation to her and James on behalf of an uncharacteristically shy David Yates aka Dolly Dolly. On the night, nobody really believed she’d turn up. Then, just as David and I were strolling past the venue doors, Trish blew in wearing a nervous grin. I think she was worried that she was late. She was, a little, but it didn't matter. It was a mark of the respect and admiration she commanded that her presence seemed to somehow prove that the event was actually taking place. Dolly David, Chris Bailiff aka Position Normal and Ian Hodgson aka Moon Wiring Club met Trish for the first time and, with remarkable speed, a clutch of future collaborations were planned. I remember Chris telling me that Trish had said, "I'll collaborate with anyone!" Rather than signal a lack of discrimination - on the contrary, Trish and James had always displayed impeccable taste in their choice of collaborators - I believe it indicated her admirable curiosity and generosity of spirit. She was continually in search of new creative horizons, adventures in unfamiliar territory. This was obvious from the manner in which Broadcast’s music got stranger - and better - with each release. Before David, Chris, Ian and I departed for our B&B and Trish made her way back to Hungerford, we all stood together and babbled in the car park like overgrown, oddly-attired adolescents. Just as Broadcast were preparing for their Australian tour, Trish and I exchanged emails about a possible appearance at The Outer Church. I was working at the January edition of the OC when I first heard she was unwell. I was concerned, of course, but I didn’t even consider the idea that this was something she wouldn’t recover from. The next morning I was told that she had gone. I’ve been utterly confused ever since. The sensible thing to do at this point would be to discuss the music in greater depth. The thing is, Broadcast's luminosity can be best gleaned from listening to the records and reading the interviews. I’m not inclined to put them in context at this stage - it feels premature and in any case, we’re hardly talking about anything so simple and trivial as a much-loved band calling it a day. I will say that Trish's deceptively cool, precise voice, whose restraint makes its underlying passion all the more acutely felt, is an unrivalled balm for loneliness and one of the most beautiful and distinctive sounds in contemporary music. In truth, the term 'contemporary' seems a little reductive. That tone slices clean through time, hovers above it, slips alongside it, extends in all directions. It folds, unfolds and enfolds, the sonic equivalent of a magic mirror. And Trish’s talents were not limited to her voice. She was a terrific musician, an enviable songwriter and a bonafide sorceress of sound. Multidimensional.